Every once in a while, every website needs a freshen up. Businesses, trends and buyers can change a lot over a relatively short space of time; Three years ago, mobile represented about 10% of all internet traffic. Fast forward to 2017 and it’s jumped to 38%1. Search engines and buyers have also undergone immense changes, with considerable updates to search algorithms, and web users expecting a different online experience. Web design is no different; It continually evolves to keep up with current trends, and so too, should your website. Website redesigns are becoming a more regular activity for many businesses, to ensure it remains looking great and helps continuous growth. However, web redesign is not risk-free. For businesses that have an established website with good traffic and search rankings, the challenge of a redesign is maintaining this so sales are not lost. it’s crucial to make your website a revenue-driving channel and not just another pretty, shiny homepage. The website redesign process is often misconstrued to be largely based on a creative overhaul. While creativity is important, the facts and figures need to be an integral part of the change. 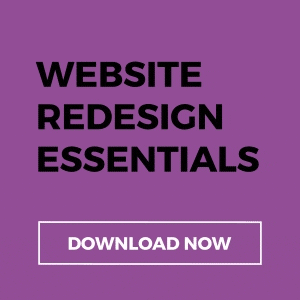 Measurable factors such as website metrics should be the driving force behind redesign. Analysis into these performance figures enable you to distinguish what’s working and what’s not. Ignoring the numbers can essentially result in two scenarios: Firstly, you might end up changing elements that are performing well and secondly, fail to recognise areas that are inefficient and leaving them unchanged. Rather than overlooking the importance of website analytics, make sure it’s your first port of call. Just because you spent hours creating appealing content for your last website update, doesn’t mean you should keep that same content during your redesign. When making significant changes to website layout and design, it’s logical to modify the content to match. Perhaps your website redesign will focus on different products or services, requiring more detailed content to fill the page. Or maybe a different slant in organisational culture means some content no longer reflects your company’s tone of voice. Changing content doesn’t just mean on your website landing pages and homepage, don’t forget about your blog posts and content offers too. While updating the necessary content during the redesign process is important, don’t forget to take SEO into consideration when doing so. You don’t want to alter content so that it’s ranking is affected and traffic is lost. SEO needs to be prioritised. Your website ranking is due to numerous factors, both on site and off site. While you can’t entirely control off site factors such as external links, on-site aspects are down to your expertise alone. You want to ensure that website changes don’t affect rankings, if not have a positive impact in driving more traffic. Use Google Analytics to distinguish which of your web pages are driving the most traffic and ranking highest. Priority should be given to preserve their ranking during the redesign process. Focus on elements like page title, keyword use throughout the content body, image alt text and number of words per page. If you decide to cut down on page text, make sure to start with a keyword audit so as not to drop any valuable keywords that your rankings depend on. The website redesign process is the perfect opening to abolish any features that have contributed to longer loading times, like externally referenced files. However, be careful not to unintentionally increase loading times in doing so. Check the loading time for each new image or feature on all platforms to gauge an efficient average. A website’s navigation is arguably one of the most important elements in a site’s design. Visitors need to use navigation to make their way through the website and find the information that they are looking for quickly. Website navigation should be clear and intuitive, not confusing or complex. According to Forrester Research, 50% of potential sales are lost because visitors can’t find the information they’re searching for. That’s a lot of potential revenue going straight down the drain. There’s a good chance that enhancing the appeal of your website is at the forefront of your mind when you undergo a redesign. Of course you want your site to look beautiful with eye catching images, stand out colours and a striking design and that’s okay. But it’s vital that developing a high functioning website is your number one priority. Essentially, you want to create a website that’s both pleasing to look at and pragmatic. Does the layout reflect the message of the page? In today’s world, there’s no excuse for a website to be ill equipped for mobile devices. As the dominant tech choice, responsive design is necessary to offer a consistent website experience for all mobiles. Not only does a responsive mobile site ensure users don’t have to zoom in and out to read content, but a mobile friendly site also enhances SEO, with Google favouring sites that are optimised for all devices. As outlined above, there are numerous challenges associated with website design. However, the key to a successful redesign is to strategically plan ahead and incorporate several important factors into a re-launch from both a creative and analytical perspective. Primarily, businesses need to establish clear goals for redesign efforts and map out exactly what needs to be transformed. Extensive research should be conducted and analysis should be carried out surrounding how you can build on existing success or capitalise on underperforming aspects of your site. It’s also important to remember to keep marketing efforts in mind and aim for a smooth transition by ensuring your plans incorporate provisions for a successful re-launch.